Home > Advice & information for householders > How much electricity am I using? If you want to save electricity (and why wouldn’t you?) it helps to focus on the things that use most, and so cost you the most money. In other words: 'what uses watt'? Some electrical items use a lot of electricity. Others don’t. As a rule, those with moving parts or which produce heat use much more than those that produce light or sound. So if you want to save electricity and money, there’s no point worrying about a digital clock or an electric razor since these use so little power you would hardly notice the difference. The big savings lie elsewhere. This is usually given in watts (W) or kilowatts (kW) (1000W = 1kW). Of course, the amount of electricity it uses depends on how long it’s on for, and this is measured in kilowatt-hours (kWh). An item like a fridge has a low wattage, but because it’s on all the time it’ll use a lot of electricity. And although an iron is only used now and again, it uses a lot of electricty so the quicker you do your ironing the better. See table below for ratings for different appliances. Electricity is sold by the kilowatt-hour (kWh) – usually referred to as ‘units’ on your electricity bill. If you’re feeling mathematical you can work out how much an appliance costs to run by multiplying its wattage by the amount of time it’s on and then by the cost of electricity per kWh. So let’s say you have a 500W (0.5 kW) dehumidifier and you run it for a whole day (24 hours). It will use 12kWh of electricity (i.e. half a kilowatt-hour every hour). If your electricity costs 13p per unit, then multiply 12kWh by 13p and you get a grand total of 156p, or £1,56. This is what it costs to run the dehumidifier all day, and you can see how appliances can add a lot to your bills. But – and sorry if this is complicated – sometimes a higher-wattage appliance will actually use less power overall than a lower-wattage one. This is because it is well designed and does its job quicker. An energy efficient dish washer, for example, may have a power rating of 2kW – the same (or higher) as a non-energy efficient one. But what makes it energy efficient is that it completes its cycle quicker. So while it may use the same (or more) electricity per hour, it’s working for less time so uses less energy overall. In other words, don’t judge the energy efficiency of a device only by its given power rating, particularly if it is controlled with thermostat or operates on a timed cycle. 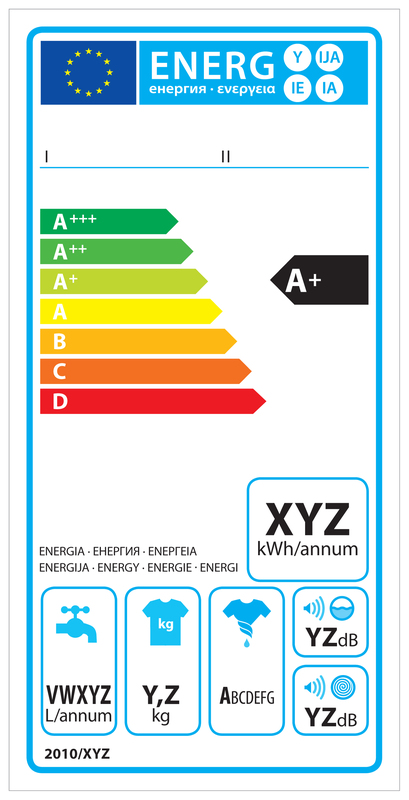 Instead, if you’re buying a new fridge or TV or other appliance, the best way to judge its energy efficiency is the label (see label). Those rated ‘A’ or above are the most efficient for their size. To compare between differently sized appliances, energy labels also now print suggested kWh usage per annum for each appliance. This table lists common appliances and a typical power rating or a range (the actual power rating can vary a lot depending on size and model). Many homes now have energy monitors that show how much electricity is being used at the present time, as well as how much was used last week, last month etc. They are wireless devices that can tell you useful things like what your current energy use is costing you. Basic models can be bought for around £30 although you may find that your local library can lend you one to try out. Read more about energy monitors here. Although a single light doesn’t use much electricity (60-100W for a typical old-fashioned bulb), our homes can have dozens of them, so it adds up to quite a lot – around a fifth of an average home’s electricity bill. As we move to low-energy light bulbs the amount we spend on lighting will go down, but it is still worth checking that you’re not leaving lights on unnecessarily. Read more about domestic lighting here. Today’s homes contain ever more electrical items. Many of these will draw small amounts of electricity, even when they are not in use, e.g. on standby. Things like TVs, set-top boxes and games consoles are most associated with standby costs, but any electrical appliance may be contributing to it. And while each individual appliance may use just 5 watts or less (costing just 1.5p if running for a whole day), it all adds up. In fact, items on standby account for around 10% of a typical home’s electricity bill – that’s £50-£86 a year. Of course, some items are left on deliberately, for example wireless internet routers and similar devices that update overnight. But, generally, people find that most items in their house can be turned off completely without much inconvenience. Use an energy monitor (see above). Pick up good habits; make turning appliances off at the plug part of your daily routine. To make life easier, you can buy sockets that can be switched off with a remote control. They cost £20-£30. You can also use timer plugs that will switch appliances off at a set time automatically. Energy monitors measure and display electricity usage in real time. Read this leaflet to find out how they can help to cut your bills.